Hello and happy Tuesday. It's time for another challenge at CASology. 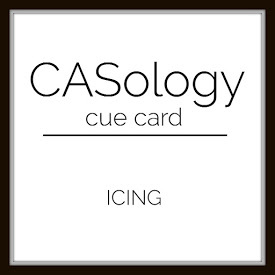 This week, our cue word is icing. I immediately thought of icing on the cake, and pulled out Candles N Confetti from Reverse Confetti to make my cake. On this card, icing is provided by colored pencils. Now it's your turn. How does ICING inspire you? I hope you play along this week. Please remember to keep it Clean and Simple. We are sponsored this week by Serendipity Stamps. Our Guest Designer is Lin B.
I like the embossed numbers behind your yummy little cake! Cute card Joyce! This is such a fun birthday card, Joyce! I really like the embossed numerical background! Ohhhhh, your cake looks so yummy! As always, I love your embossed background! Such a pretty birthday cake and I love how you added embossed numbers on the background...such a lovely take on the cue card, Joyce! The perfect CAS iced cake, I love the embossing.